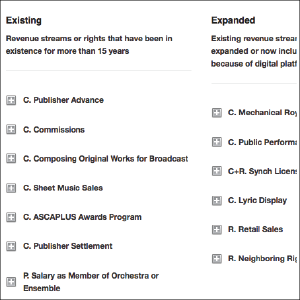 Artist Revenue Streams | a multi-method, cross-genre examination of how US based musicians and composers are earning a living. Just how many revenue streams are there for musicians? As both the genesis of this project and a framework for the research, FMC compiled a detailed list of the 42 45 Revenue Streams available to US-based composers and musicians based on their compositions, sound recordings, performance, brand, or knowledge of craft. Learn how these income streams have evolved over time at Revenue Streams: Existing, Expanded and New, and how we asked questions and grouped Revenue Types in our research. We have amassed huge amount of qualitative and quantitative data collected through: (1) in-person interviews, (2) a large-scale online survey, and (3) financial case studies that examine the actual income and expenses of working musicians over time. Instead of issuing one enormous report, we have been examining the data through various lenses. Read our Reports and Data Memos, or explore these Financial Case Studies. 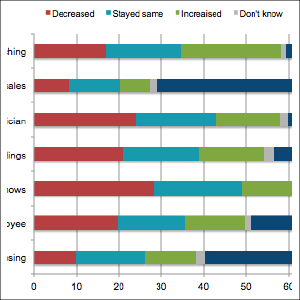 Explore the Money from Music survey data through this Interactive Data Platform. 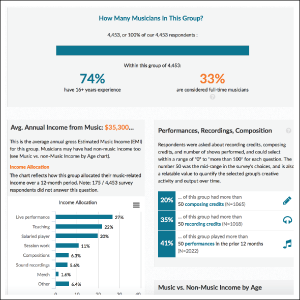 See how income sources differ based on genre, role, music education, age, and more. We have presented our findings at dozens of industry and academic conferences including SXSW, MIDEM, NARM/Music Biz, FMC's Policy Summit, San Fran Music Tech, Arts Presenters, Chamber Music America, Jazz Educators' Network, MEIEA, Music Business Research Days (Vienna, Austria), Society of Ethnomusicologists Annual Conference, and more. Get in touch with us about presentations or research collaborations.